We hope you enjoy this detailed journey of the building of our family's pizza & bread oven. Building this oven and sharing our story with everyone has inspired our on-line store below, which funds our daughter's education. Frankie's Oven - why we built it. A few years ago, I was meeting with an associate in the pizza business and I asked him how he got started in the pizza business. He began to tell me the story of a home he owned in Up-State New York, and how he loved the pizza in that area. His favorite restaurants used either a coal-burning or a wood-fired oven. This gave him an idea. He read a book. 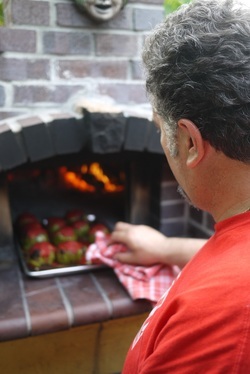 Building a Wood-Fired Oven For Bread & Pizza, by Tom Jaine. This gave him the motivation to convert an old wood–burning stove (like one would find in their Great-Grandmother’s kitchen) into a wood-fired pizza oven. He continued to tell me how he would have pizza parties in the fall when the vegetable garden was in heavy production. Everyone at the party would join in making pizza and end up going to the garden and put whatever they wanted on a pie. That one hit me. I mean…… that really hit me. What a great idea! I needed to build an oven next to my own garden so that I too could have pizza parties with my family and friends. So, when we bought a home with room in the backyard, my research began. This book tells you everything you need to know and more. Don’t even try to make the oven without it. Alan Scott, has dialed-in every detail and has made every effort to save you thought, mistakes, money and your back (working with cement). 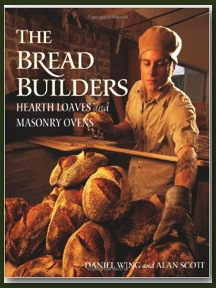 Alan's knowledge of the craft can be learned in the book, and he also sells oven plans for various sizes and such. Although one can build an oven from reading the book, I recommend purchasing a set of plans from Alan Scott. My Sister-in-law Gina inherited quite a few cinder blocks when she purchased her new home. I have to say, she gave me the kick in the fanny I needed to start my project by showing up at my house with 100 blocks. This started me on my way. Below, I have tried to document the process and the steps we followed that completed this dream. I hope you enjoy.